Huaneng Daqing Thermal Power Co., Ltd. was registered in Daqing Trade and Industry Bureau in April 10, 2012. Huaneng Daqing’s 2 × 350MW Cogeneration Project was invested by Huaneng Daqing Thermal Power Co., Ltd. to build urban thermal power plant. Huaneng Daqing Thermal Power Plant is located in the economic and technological development zone in Daqing City, Heilongjiang Province. Daqing is China's largest oil field and the world's tenth largest oil field, in which it has made tremendous contributions for the development of the national oil industry. 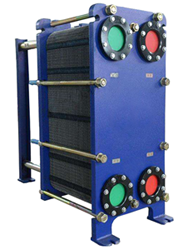 In the application of Hofmann(HFM) plate heat exchanger in the coal-fired power plant cogeneration system, Huaneng Daqing Thermal Power Plant is a very good engineering sample case. In this term, Huaneng Daqing Thermal Power has made 2 × 350MW extraction steam heating units; planning capacity is 4 × 350MW units. It mainly provides heat for enterprises in Xicheng provincial industrial park in Daqing city. The main equipment of the project: steam turbine manufacturer is the Harbin Turbine Factory Co., Ltd.; boiler manufacturer is the Harbin Boiler Works Co., Ltd., the maximum continuous evaporation (B-MCR) is 1110t/h; generator manufacturer is Harbin Electric Factory Co., Ltd.
Hofmann(HFM), as a famous brand in heat exchanger industry, is also involved in the construction of the project. A huge number of demand and large heating gap are the reality problem in our country. Compared to the current surplus electricity market, the seller tends of heating market are more obvious. Under the control of the total coal consumption in China, how can people use the least amount of coal consumption for the most hot? Compared with the current major heating methods, it is easy to get the answer. At present, the main heating methods are cogeneration, regional boiler room, decentralized boiler room and small stove, and so on. Through the comparison, it is found that the thermal efficiency of coal combustion is the highest, about 80%, followed by the regional boiler room, whose thermal efficiency of coal burning is about 60%, and the advanced technology is more than 70%. The coal thermal efficiency of the small boiler room and the small furnace are relatively low, respectively less than 40% and 15%. The energy saving of cogeneration is significant, and the thermal power plant chimney is up to 100 meters above. The flue gas is made high- altitude emissions, and the exhaust is through rigorous treatment, greatly reducing the pollution of the urban environment. The industry believes that the development of cogeneration can not only increase the central heating area, reduce environmental pollution, but also can increase the economic benefits of thermal power plants, "based on national policy, in the power dispatch, the thermal power plant is priority on the Internet. At present, Chinese power situation is good and encourage clean energy making more power, and the development of cogeneration can help thermal power to get more planned electricity. In the Huaneng Daqing Thermal Power Plant, in order to make better use of the boiler combustion to produce flue gas waste heat, improve the heat transfer efficiency, choose to use heat transfer program provided by Hofmann and four German GEA original import all-welded plate flue gas heaters. The total design requirements: the form of flue gas heat exchanger is the gas-water heat exchanger, the flue gas inlet of the heat exchanger is connected with outlet of boiler induced-draft fan; heat exchanger flue gas outlet is connected with desulfurization absorption tower flue gas imports flue. The flue gas recovery heat, in winter, heats the hotline circulating water; in summer, heats the turbine part of the condensate. Hofmann as a well-known brand in heat transfer industry, using years of practical experience for many power plants, solves the heat transfer problem of thermal power generation system. The heat transfer products effectively solve the thermal utilization requirements of power plants. We will always be committed to better solve the user's problems, to create adaptable heat transfer services.